1. It doesn’t rain in Seattle as much as you think it does or does it? Well, this is a two-part answer. No, it doesn’t rain as much as people are led to believe. It does if you are measuring the days of rainfall Seattle gets per year. At 38 inches of rain per year, we are not even in the top 50 list for annual rainfall in major U.S. Cities. We are in the top 5 cities for the number of days of precipitation at 151 days per year. We also average 226 cloudy days a year with only 58 days of clear skies. It’s no wonder people who move to Seattle suffer from S.A.D or Seasonal Affected Disorder. It doesn’t rain almost 90% of the time. If you add up all the hours in a year, Seattle only gets rain 11% of the time. For a time other cities like Olympia, Port Townsend and Port Gamble had been named, but the settlement now known as Seattle was nameless until a clerk in Olympia called it Duwamps to the dismay of the residents. At the insistence of Doc Maynard, the settlers quickly put together a less repulsive name. Named after Chief Seattle (also known as Sealth, Seathle, Si’ahl, Seathl, Seeathl, or See-ahth) or si?al in his native Lushootseed language. He led the Duwamish and Suquamish Tribes when settlers arrived in the greater Seattle area in the 1850s. Chief Seattle was an ancestral leader of the Suquamish Tribe born in the 1780’s at the Old-Man-House village in Suquamish. Coming from a wealthy family, he lived in Old-Man House which could accommodate as many as 600 family members and guests and was close to the length of an entire football field. Divided into 40 separate rooms, each with its own fireplace and separate entrance and a roof covered with cedar planks, Seattle grew up in privilege by Native American standards for the time. Instrumental in building the bonds between the settlers and the local Native Americans, he became known as a peacetime chief and gained the respect of the settlers. His first encounter with the white man happened one Spring day in 1792 when out of nowhere a towering British sailing vessel came gliding into Puget Sound. Anchored off of Bainbridge Island, the ship was the H.M.S. Discovery and commanded by explorer George Vancouver. This was one of the first vessels known to have explored the Puget Sound waterways. During the two weeks the Discovery remained anchored, Seattle’s Father Schweabe acquired an extraordinary amount of wealth, impressing on Chief Seattle what could be gained through partnerships some 60 years later. 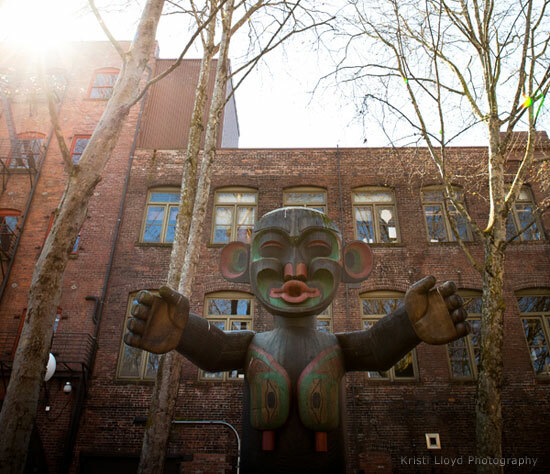 Chief Seattle’s reaction may have been one of horror upon learning the city would be named after him. The Native Americans had a superstitious fear of having their names mentioned after death. Though there are different accounts to his reaction, one that we find humorous is that Chief Seattle feared he would be rolling over in his grave every time his name was spoken after his death. To ease his suffering in the afterlife, the citizens of Seattle created a self imposed tax and paid the chief a sum of money for the privilege of using his name until his death. Thankfully the citizens of Seattle stuck to their bargain because the chief was instrumental in keeping over 4,000 tribal members from six tribes, from participating in what would be known as the Battle of Seattle. Chief Seattle also freed his own slaves on the event of Lincoln’s Emancipation Proclamation in 1863. A group of Seattle pioneers placed a marble headstone on his grave in 1890 in recognition of his legacy. Inscribed on his gravestone at his burial site at the Suquamish reservation near Bainbridge Island is the incorrect spelling of Sealth. The spelling is an approximation of the native pronunciation of the Chief’s name, though the “th” sound was not part of the Salish (Lushootseed) language. Though his funeral and death in 1862 was not covered by the local newspaper, Seattle is memorialized in his namesake city with a Pioneer Square bronze bust (1909) and a Denny Regrade statue (1912), both sculpted by James A. Wehn. According to a plaque at Pier 32, 2264 E Marginal Way S in Seattle. There is some discrepancy when researching this but here is a link to an image of the plaque. Don Ibsen is one of four inventors credited with inventing water skis. Unbeknown to each other, over a period of 15 years water skis were invented at least four times, by four people independently of one another. Shaping his own skis of cedar boards, 7 feet long and 8 inches wide and testing them on Lake Washington as he bummed rides from local boaters at Leschi marina . During the 1930s, Ibsen became one of the first water ski manufacturers and started what was probably the first water skiing school, the Olympic Water Ski Club. He also created a water ski team to perform shows around the Northwest and appeared on the pages of Life magazine, in full business-suit attire, complete with attache case, as he commuted to work via water ski. 5. John Nordstrom got his start in the Klondike. Johan Nordström was born on a small farm in Alvik in Neder Luleå and arrived, only 16 years old, to Ellis Island with five dollars in his pocket and not a word of English in his vocabulary. After deciding farming wasn’t for him after scraping enough money to purchase 10 acres in Arlington, Washington he headed to the Klondike in search of fortune. Investing $1,500 for 50% of a mining claim on Gold Run with two other miners who partnered on a 1/4 of the claim, Nordstrom set to work. When the claim was challenged and a lawsuit was filed he and his partners decided to sell it for $30,000, netting Nordstrom $13,000 after paying expenses. Returning to Seattle and eager to put his money to work, he partnered with Carl Wallin and opened a small shoe store, Wallin and Nordstrom. As we know, the rest became history and John did very well, but what happened to the mining claim he sold? Over $2 million of gold was taken from the claim he sold for a mere $30,000 according to the Klondike Gold Rush Museum in Seattle. 6. Seattle has the second most glassblowing studios in the world. Dale Chihuly has no doubt been a huge influence on the city of Seattle. A co-founder of Pilchuck Glass School located in Stanwood, WA is an international center for glass art education. Dale Chihuly was also the first person to be proclaimed a “Living National Treasure” by President George Bush in 1992. The first is Murano, an island near Venice, Italy. 7. More people bike to work here than any other city in the U.S. Almost 4% of our commuters criss cross the city on two wheels. We are also home to the 14,000-strong Cascade ­Bicycle Club—the biggest in the United States. Seattle was the first city to put cops on bikes and every precinct in the city utilizes bike patrols in providing police services to the city. Central Conn. State University ranked Seattle the most literate city in America. Everybody reads here. The Seattle Public Library system has the highest percentage of library card-holders per capita in the country. Seattle also has the highest percentage of residents with a college degree or higher. On October 31, 1981, Robb Weller (Yes that Robb Weller from Entertainment Tonight) is credited for inventing the Wave. A ubiquitous sight at sporting events around the globe, the UW played Stanford (With John Elway quarterbacking) at UW’s Husky Stadium. By the way, the Huskies won 42 – 31. A week later the wave was introduced at a Seahawks game at the Kingdome. On a side note: Bubble gum, vinyl, synthetic rubber and the color TV tube were all invented at the UW. Husky Stadium has the record for having the loudest game in college football history: 130 decibels in 1992 against the Nebraska Cornhuskers. Yes, it’s true, there is no jaywalking in Seattle unless you are a tourist. Maybe its a slow cadence in our lifestyle or the fact that its an unwritten rule and you will receive a ticket. We’ve heard the ticket is anywhere from $56-$75 per ticket and have seen policemen waiting a half block from an intersection on motorcycles in the financial district, waiting to “pull people over” to write a ticket. Some critics say jaywalking tickets have led to fights and alleged abuses from Seattle police officers. This entry was posted in Seattle Info. Bookmark the permalink.